Lecache European Series 5200 - discounted freight! 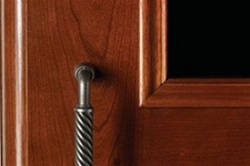 LE CACHE Euro 5200 Window Door shown in Classic finish on Cherry wood. Designed by acclaimed, Pinnacle Award-winning designer Martin de Blois, our European Country Series wine cabinets evoke the timeless elegance of European furnishings. Architectural details such as crown and base molding, paneledsides, hardwood French doors and hand-carved accents showcase fine wine collections with a sense of luxury and style.Sealed seams, premium insulation and tinted double-paned glass provide thermal and UV protection. 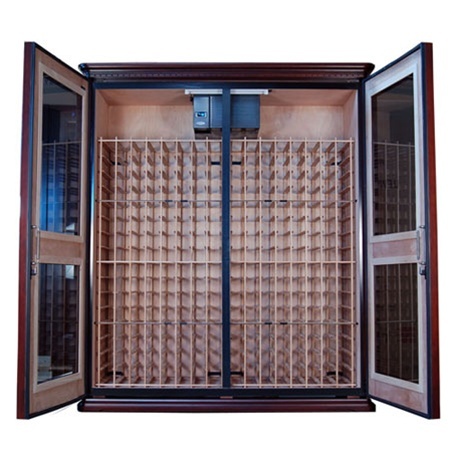 Wine Cabinet - Pre-assembled, insulated cabinet regulating proper temp/humidity for long-term aging of Red and White wines. Door Type - Cherry wood-veneer frame with UV tinted, thermal-insulated, double-paned window(s). 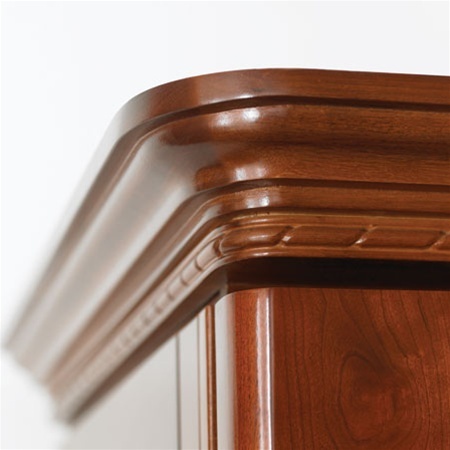 Exterior - Choice of Satin finish: (1) Provincial on Cherry wood (2) Classic on Cherry wood, (3) Chocolate on Cherry wood and Click Here to view. No other wood/finish choices available. Also equipped with brushed-nickle handle. Racking - Finished Cherry individually cradles 3½" diameter bottles (3¾" rack opening) plus bulk storage. Click Here to view. Venting - Top exhaust to position cabinet flushed against the wall requiring at least 18" clearance at top for proper ventilation. Cabinet cannot be placed into an alcove, closet, or built-in environment. CellarPro System - Powdered-coated black/charcoal finished system with Blue LED display, and fingertip control for temp and humidity. Plugs into standard 110v outlet. Choice of (a) Ultra-quiet 1800QTL for interior environments. (b) The 1800QT is slightly louder and can be used most interior environments and recommended for larger cabinets (model 3800 & 5200). (c) Upgradable to 1800XT for extreme environments (ie. hot/humid garage) with compromise for increased noise level. Required for commercial applications as well as non-temperature-controlled environments -- like garages and basements -- up to 95°F. Warranty - 2 year limited warranty on cabinetry and 5-yr on entire cooling system. No custom size, custom racking, or color stain available. Cabinetry manufactured overseas with final assembly in the USA. Cooling system manufactured in USA. * Bottle count is based on all standard 750ml & includes bulk storage. High-output LED lighting offers superior illumination and efficiency, and generates cool white light throughout the wine cabinet. Front-vent hood and grill allows you to place your cabinet in alcoves, built-in spaces and locations with low ceiling height. The hood also reduces noise from the cooling unit by 3-4 decibels. Grills are available in a choice of colors - black (shown), white, silver or brown. Click here to view. Sound Hood is designed to reduce noise by 2-3 decibels. Dual-zone modification provides two completely-separate temperature zones with optimal red wine serving temperatures in one side of the wine cabinet, and optimal white wine serving temperatures in the other side. Perfect for restaurants, hotels and bars that need to maintain both serving AND storage temperatures inside one cabinet. In the left half of the cabinet, temperatures can be set as low as 45 degrees, perfect for serving most white and sparkling wines. 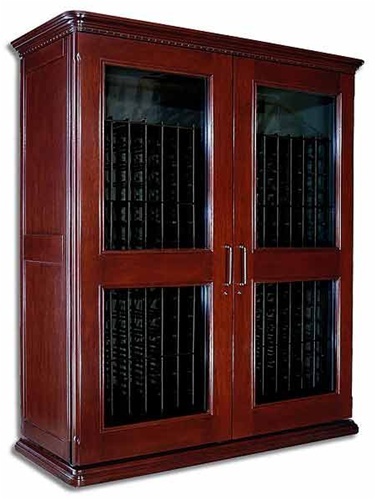 In the right side of the cabinet, temperatures can be set as low as 55 degrees, perfect for serving red wine. When you purchase a dual-zone kit, we will include automatically the CellarPro 1800XTS cooling unit at no additional charge. 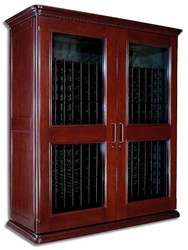 Carpet boards are recommended for wine cabinets that will be placed on thick carpeting. Our carpet board is an unfinished piece of 3/4" plywood, cut to the footprint of the wine cabinet. Allow 1 week to release to shipper from date of order confirmation. Our helpful calculator will total the options for you. Utilize the above drop-down menu to calculate the Update Price totals before any shipping charges or sales tax (CA only).